With the year 2016 rapidly approaching, the news and publicity of the abundant amount of presidential candidates is steadily increasing. Having the options of an overwhelming amount of Republicans and a rapidly decreasing number of Democrats, is leaving some voters conflicted, but there is a solution. Senator Bernie Sanders of Vermont is currently polling higher against Republicans when compared to Hillary Clinton. Additionally, Sanders agrees with socialist beliefs, including his ideas for free public college tuition and free healthcare, showing that Sanders cares for the American people as much as he would for his own family. 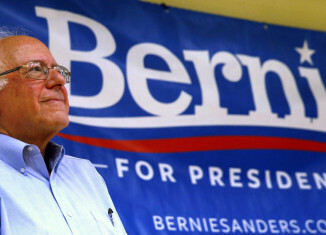 Senator Sanders has been a longtime supporter of LGBT+ rights and has taken various actions in an effort to improve the quality of life for the LGBT+ community, including, but not limited to, voting against “Don’t Ask, Don’t Tell,” which was used to discharge assumed and confirmed members of the LGBT+ community from military service. Sanders is also a cosponsor of the Equality Act, which exists to expand the Civil Rights Act of 1964 and other anti-discrimination laws, to improve and create protections for Americans based on sexual orientation and gender identity. On the other hand, Secretary Clinton has often been known to vacillate between political, social, and economic opinions. This trait has been evident with Clinton’s past, noting that she had once been against LGBT+ rights until 2008, when Barack Obama was elected for his first term as President of the United States. Additionally, some voters may find it difficult to trust Clinton as a result of the recent scandal involving her misuse of private email when serving as Secretary of State. Even without a comparison to Hillary Clinton, it is more than clear that Bernie Sanders is the optimal choice for our next president. Along with his active support for the LGBT+ community, Senator Sanders has shown that his foreign policy and domestic thoughts are increasingly suitable for our modernized country. Sanders has publicly announced that his plans as president include making public college tuition free and paid for by taxing Wall Street speculators, acting upon global warming and climate change issues, and supporting the Joint Comprehensive Plan of Action to ensure that Iran’s nuclear program would be exclusively peaceful. With all this going for Senator Sanders, it is unclear as to why many eligible American voters do not know more about him. This may be a result of his campaign lacking a super PAC and taking only the donations of voters instead of those from a collective group of people like a corporation. Even without these benefits, Sanders is still thriving in the Democratic race and is likely to beat out Clinton for the coveted Democratic nomination for the next President of the United States. Why Does Fashion Repeat Itself?